PERPETUAL from the rolling hills of Spain has taken three years to top their previous efforts on their first full-length album Carving A Dismembered God and they have succeeded with their sophomore album Maze of Chaos. A paint-stripping barrage of nine chemical-reacting tunes that blare from a melting speaker. With a theme focused on the hells and consequences of politics and religion, PERPETUAL’s Maze of Chaos and their very name reflect the cyclical nature of the violence that is associated with people who have more power and more money than they ever should have had. An ouroboros for sure, this nightmarish journey through a difficult maze will surely leave you dead if you don’t find a way to escape it all. Maze of Chaos begins with being cut off from everyone including one’s self in the instrumental intro “Isolated”. The tone of the album tries to match the volume of the demons that plague the band’s heads, with guttural snarls and bloated, slow moving breakdowns. There is plenty of bitter medicine to force down the throats of those who still see the need to crush the powerless into dust. In the terrifying closer “Lobotomy” vocalist Hector Gonzolez screams for mercy as Ivan’s drums beat like a rapid heart rate as the gleaming icepick in the surgeon’s hand comes ever closer. Maze of Chaos features lots of burnt-to-a-crisp riffs and solid beats marching off either obliviously or resolutely towards some kind of inevitable doom. Paying tribute to their heroes the ever-ubiquitous Lovecraft and Poe, they create sound loud enough to wake the Ancients below the surface. Maze of Chaos has furious rhythm when it wants you to run and slow-moving interludes when they want you to hide and wait out being found. 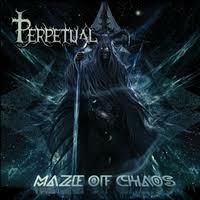 PERPETUAL is forever, and so is the Maze of Chaos.